The Nubian museum will be closed for 2 weeks for security issues. Dr. Zahi Hawass announced that a specialised company was chosen to work on an intensive project to replace the surveillance cameras and security system including the alarms which are out of date and suffer of repetitive malfunctions since the museum opening in1997. Hawass added that the museum will be closed for 2 weeks plus intensify of security personnel presence during the project inside the museum and in the surroundings. The Egyptian Hotels association and tourism police were notified to take the required procedures. 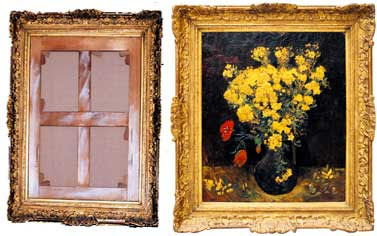 The photo below shows the painting(Right) and the frame at the museum now (Left). There were few surprises during the investigations. The minister of Culture,Farouk Hosni went to the General Prosecutor himself to testify with his knowledge concerning the current ongoing investigations. The surprise is what he said and what the Deputy minister who is in custody now said about the museum status.